The life of Andrew Carnegie has all the classic ingredients of a rags-to-riches saga. Few have accumulated so much, and few have given so much for the public good. ■ Born in Dunfermline, Scotland, Carnegie came to the United States with his family in 1848 when he was 13. The Carnegies settled in Allegheny, Pennsylvania, later absorbed by Pittsburgh. Young Andrew worked as a bobbin boy in a textile mill, and later as an engine tender and telegraphic messenger and operator. He worked for the Pennsylvania Railroad (1853-65) where he introduced the sleeping car. He left the railroad to work in a steel mill, and in 1873 he started the Keystone Bridge Works. ■ By 1888 he had added a railroad, lake steamships, and coal and iron fields to his control. In 1901 he sold out and the reorganized sale was later to become the U.S. Steel Corporation. 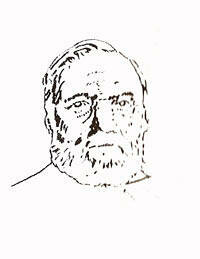 ■ Carnegie had retired from business to devote his time to spending his wealth for social and educational advancement. He offered to share the expense of building and maintaining libraries throughout the English-speaking world. ■ In 1900, he founded the Carnegie Institute of Technology at Pittsburgh and the Carnegie Institution in Washington, D.C. He established a trust fund for the benefit of Scottish universities and was a substantial benefactor of the Tuskegee Institute, a college for Negroes in Alabama. ■ Carnegie set up a pension fund for his former employees and established hero medals in the U.S. and U.K. He donated the funds for the erection of a Temple of Peace at the Hague and the Pan American building in Washington. ■ In 1911 he endowed liberally the Carnegie Corporation for the ":furtherance of civilization." He died August 11, 1919 in Lenox, Massachusetts.